This is in response to Chris's jibjab video of me and Robert. Here are some pictures of Sean trick or treating with his cousins on Jamie side of the family. These are some pictures of my wife Jamie and her co-workers on Halloween. Here are some pictures of my son on his first camping trip. Some of the pictures are courtesy of my brother Chris and his girlfriend Amanda. My roommate decided to shave his head, here is some of the pictures of him in between shaving sessions. This is the end process. This is a picture of before, around easter. My Son having fun at the expense of others. Here is a video of my son head banging Jamie chest because Eric our roommate was head banging first. Try not to care what is being said by Jamie and my roommate Eric it will not make sense. But enjoy the video all the same. Here is more of my son sleeping but with me holding him. Here are some pictures of my son with evil Fairy wings on, being held by the crazy grandma. 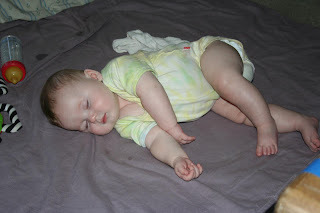 My son Sean likes to sleep in different positions now that he can roll over. Here is just some of those positions. 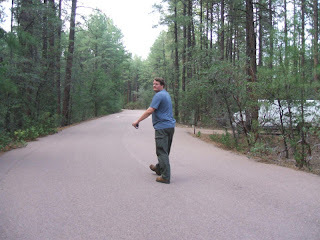 On a recent trip to the forest in the Payson area. Amanda the (I can't live with out my Soda) survivor woman, happened upon one of many sightings of Bigfoot the hairless Apeman. For our 5th anniversary we went up to Ash Fork, AZ to visit with a friend of the family. The place we stayed at belongs to a close friend of my father-in-law Mark. Cody has been Mark's friend since High School, he lives on 40 acres of land with open space for animals like rabbits, crows, coyotes, and skunks to roam on. This year when we went up to visit Cody, we went to the Grand Canyon, Williams, Seligman, Flagstaff, and the Deer farm. These are pictures I took of Sycamore point, done in HDR. On the way back to Cody's house we came across some horses. The horses were just walking down a dirt road leading back to Williams, AZ. Cody decided to pet one of the horses and the horses decided to block our way for awhile. So I got out and took some pictures. Then one of the horses thought my window tasted good and licked it. One of the horses followed me around the vehicle. On one of our trips Jamie, Sean and I went to a place call The Deer Farm and took some pictures of the animals that live there. On the way out, one of the deer tried to eat Jamie's shirt. August 1st: Jamie, Sean and I went to the Grand Canyon. We came upon a squirrel eating what looked like a fried chip that someone gave it. I took some video of the squirrel eating, and me petting it. Jamie took some pictures of me playing with the squirrel. I even got the squirrel to sit on my lap for a few seconds. I then took pictures of us at different parts of the canyon. I took a picture of the sky in HDR. I took some pictures of the canyon every once and awhile. The photo of the village is where my Aunt says my adopted cousin Alfie came from. After we decided to head back to Cody's we came upon some more deer. At sunset in Ash Fork I took these pictures in HDR. Cody showed me a back road to his house and I took this picture in HDR. Here is some of the pictures we took at Cody's. 1st picture is of Jamie and Cody keeping Sean from rolling away. 2nd is of Sean in his new Capt. Dribble outfit. 3rd is of Jamie being kicked by Sean when I was talking to him. Two days before we decided to go home I shot this jackrabbit. It was about 50 feet from me sitting under a tree. I had recently purchased a Ruger 10/22, converted it to a bull pup, and put a red dot sight on it. Earlier in the day I had sighted it in to about 50 feet, so I took aim at the jackrabbit and pulled the trigger. I thought I had missed when I heard the thump of the bullet hitting it. Cody's step daughter brought up her ex's mother, because she is taking care of her, but she kept on complaining that she wasn't having any fun. She asked if she could ride on Joe's (Cody's Friend) ATV. So Joe gave her a ride. On the last day we took a group photo with Cody and his friends and some of his family. From left to right Jamie and Sean, Virginia and Sam with her dog Socks, Joe, Tonie and her son Brody, Me (Mike) and Cody.